One of the first perennials to show in our vegetable garden is sorrel. I do so love perennials. With absolutely no work on my part, this frost hardy sorrel comes up year after year. When the bulk of the garden is bare, the sorrel, together with the stinging nettle, provide a much needed spring tonic. Sorrel is relatively unknown here but it should be more well known and the following soup will help remedy this situation. Sorrel is popular in Spain and France where it is used in soups and salads. It has a sharp, lemony taste and the young leaves can be cooked like spinach but it does not hold up like spinach. It simply melts which makes it perfect for soups or as a filling for tortellini (see next week’s post). If you are unfamiliar with sorrel use it sparingly in salads to start with. We have two types of sorrel at here at the Farm. Rumex acetosa above; Lily, the sorrel pony below. 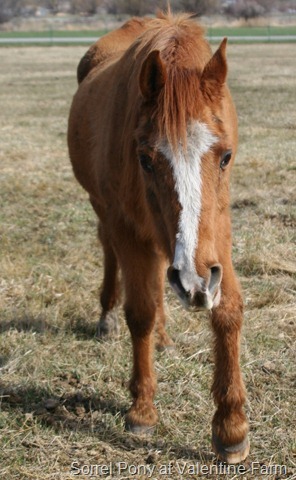 Sorrel, in the pony world, is simply a reddish brown horse. Sorrel is mentioned by the Roman writer, Pliny, and it was known to grow in 16th century English gardens. The following soup is a favourite in Alsace. 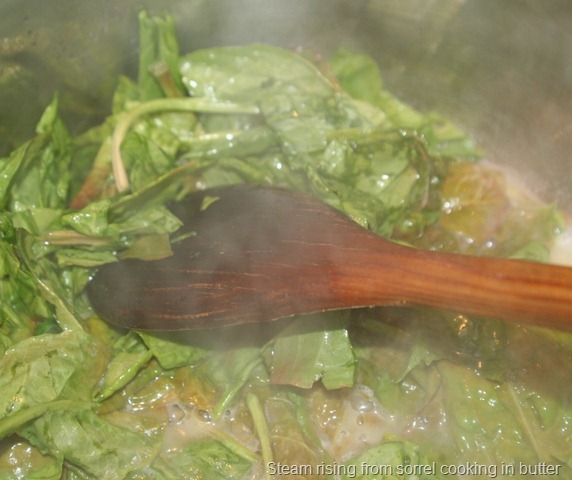 Sorrel, when cooked, gets quite viscose and this fact makes this soup incredibly smooth without using a blender. The sorrel simply breaks down and the result is, quite simply, fabulous. Veloute is a white sauce thickened with cream and eggs. 1. 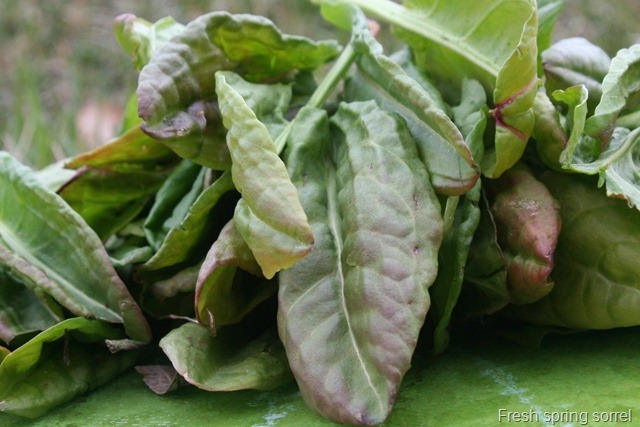 If using spring sorrel wash leaves thoroughly and roughly chop. If using mid season or later sorrel cut off stems before using. 2. 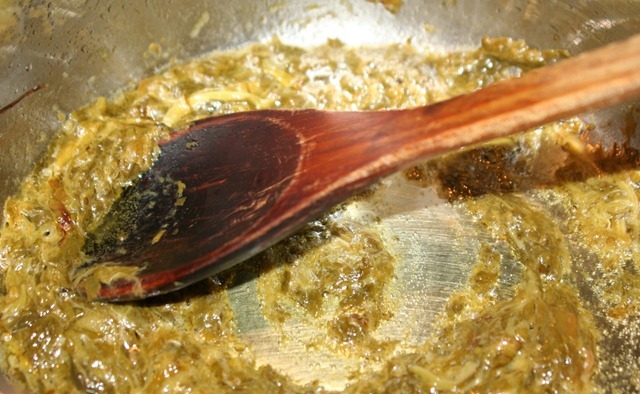 In a medium saucepan, melt butter, add sorrel and cook, stirring occasionally, until sorrel is wilted and most of the liquid has evaporated. 3. 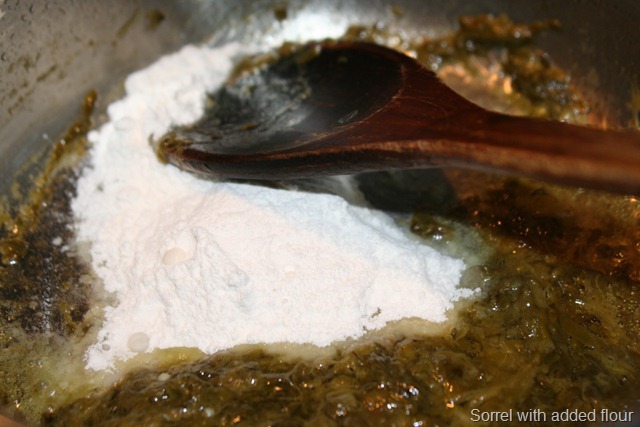 Sprinkle sorrel and butter with flour and cook, stirring, until flour is absorbed. Gradually whisk in water or stock. 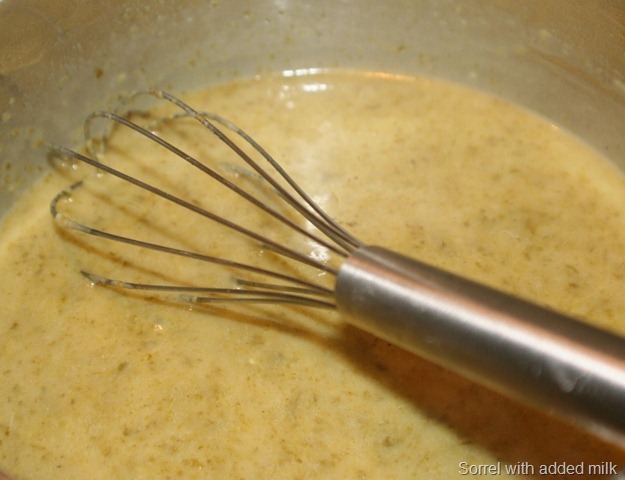 Add salt and pepper to taste whisking constantly. Reduce heat to low and simmer, uncovered, for 20 minutes whisking often. 4. Whisk in milk and bring to a boil. Remove from heat. Add one tablespoon white balsamic vinegar. Soup can be made up to this point and kept, covered, one day in refrigerator. 5. In a small bowl, beat cream with egg yolk. Gradually whisk in one cup of hot soup being careful not to curdle the egg. Pour this mixture into remaining soup. Return soup to low heat and cook, stirring, for two minutes. DO NOT BOIL. Adjust seasoning. 6. Serve in heated bowls with toasted croutons. 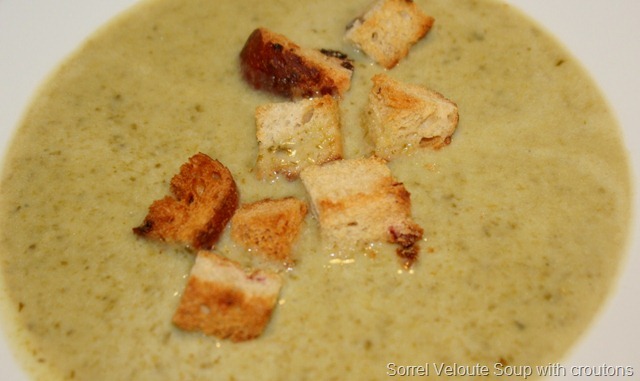 Enjoy this beautiful spring soup! What you accomplish with the recipes I share with you is what makes me eager to share more. As always, I thank you for following.